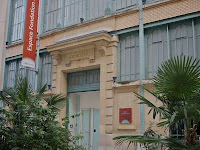 Paris is often called the City of Light, a name that refers to its reputation as a place of learning and ideas, especially during the Age of Enlightenment. It's also well known as a centre of art and culture, and as a city for lovers. 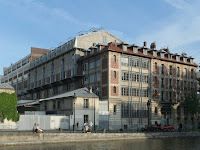 Perhaps a less well-known side of Paris is its former reputation as an industrial city. 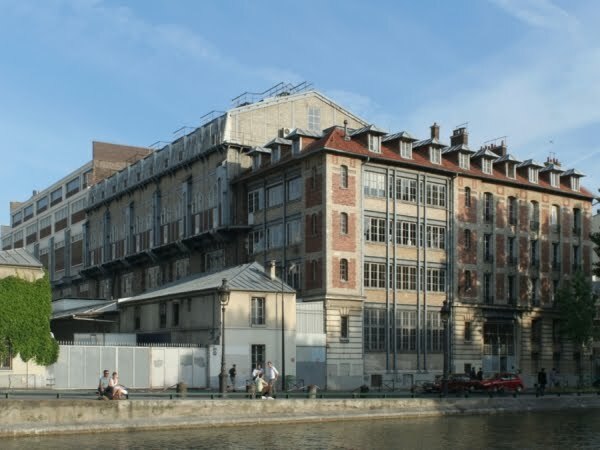 For example, the Sentier neighbourhood was until recently famous for its textile industry; the alleyways off Rue de Charonne were once filled with cabinetmakers' workshops; and the banks of the Canal Saint Martin were lined with factories and warehouses. In recent decades industries have tended to flee to the suburbs (or to China! 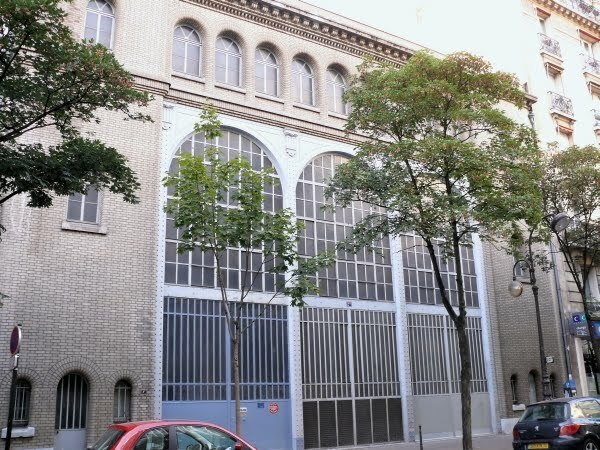 ), and Paris has become more and more residential, but there are many signs of the city's former industrial glory for those who look hard enough. Towards the end of the 19th century there was a rapid growth in the use of electricity in industry, and with this growth came the need for electrical power stations throughout the city. Many of these plants were designed by Paul Friesé (1851-1917), a civil engineer and architect from Alsace. 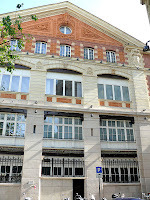 He built his first on Rue des Dames (17th) near Place de Clichy. 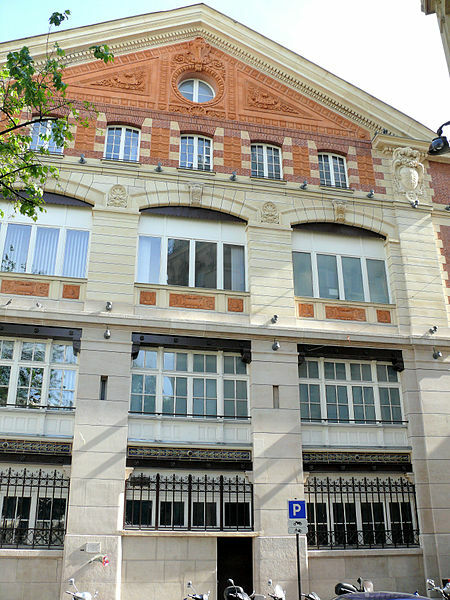 Its great façade is rather classical in style, topped with a red-brick pediment bearing the inscription "Anno 1890", while the use of steel and glass gives it a modern industrial touch. His masterpiece — alas no longer standing — was the power station on the Quai de la Rapée, between Gare de Lyon and Bercy, which was comparable in size with the famous Battersea Power Station in London. 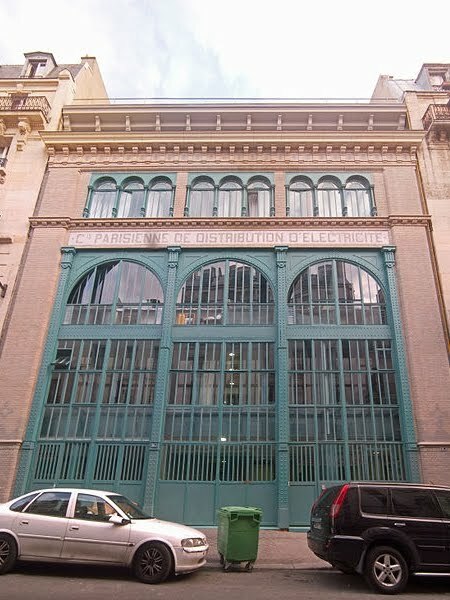 Perhaps Friesé's finest industrial construction still in existence is the power station he designed for the Paris Compressed Air Company on Quai de Jemmapes (10th). The administration building on the waterfront is in red and ochre brick, supported by visible steel girders. The gable end of the main building — which contained the machinery and was once dominated by tall chimney stacks — can be seen behind. Its steel structure is more clearly visible, including the elegant cross-shaped supports above the windows on the upper level. The complex is now occupied by the paper manufacturer Exacompta Clairefontaine. 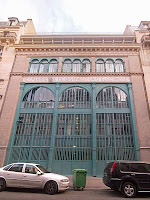 With the opening of the Paris metro in 1900 — to coincide with the Exposition Universelle (World Fair) of that year — and its rapid expansion in the first decades of the 20th century, several electrical sub-stations (transformers) had to be built to supply the network with power; all were designed by Friesé and several are still standing today. 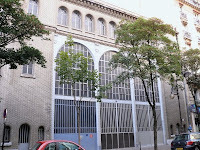 The most impressive of the sub-stations is situated on boulevard Bourdon, near Place de la Bastille. It is built on a metal structure with a brick façade. 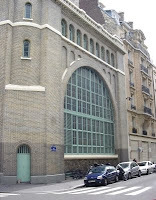 On one side there is a massive semi-circular metal-framed window, its form repeated in miniature in the row of arched windows above, and in the patterns on the brickwork. Friesé also designed schools, banks, apartment blocks and other buildings, but it is for his work in industrial architecture that he deserves to be remembered. Most of his surviving buildings are registered as historical monuments. Aw Paraic, this is great, much enjoyable writing. I suggest submitting the whole lot to a publisher after you are finished blogging it. Learning about my own city from the mouth of a Dubliner. What-ho! Thanks for the encouragement, Rémi. Paraic - I love the stuff on this blog and imitation may be the sincerest form of flattery as there is much similar material I have about London. For me the fascination continues to be the Tale of Two Cities. How the capitals of the Anglophone and Francophone worlds developed into two Megacities around the same time and had to tackle the problems of slums, transport,markets, water, energy, hospitals, social services, public spaces at the same time but generally took different approaches resulting in fascinating contrasts between two World Cities. Trés intéressant !! Je connaissais certaines de ces sous-stations (par ex. celle du Bd Bourdon) pour y être passé devant à pied ou en Vélib', mais en les regardant distraitement. J'ignorais tout du sieur Friesé. Je vais pouvoir frimer devant mes touristes..